But whether Tiger Woods returning to the winners' circle after five years, four back operations and one DUI arrest is the greatest comeback, second greatest or not even in the top 10 simply could not matter less. 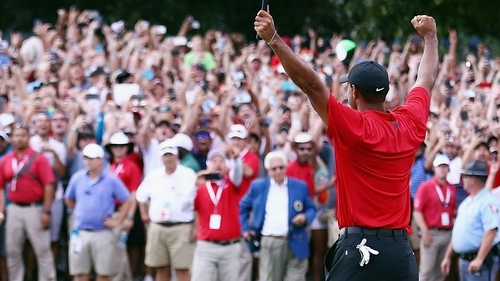 All that does matter is that Woods is back where he belongs among the world's elite and can focus now on achieving a feat that will see him automatically ranked as the greatest of all time, namely surpassing the 18 major titles won by Jack Nicklaus. "I've been in bed for about two years and haven't been able to do much," Woods revealed ahead of the Hero World Challenge, where he would finish ninth in the 18-man field. In that sense his victory in the Tour Championship came as no surprise, but for anyone who had watched Woods become a shadow of his former self in recent years, surprise - or even amazement - would be a completely understandable reaction. After winning five times in 2013, Woods had started just 24 events in the next four years as the pain from his back often left him grimacing in pain or forced to withdraw from events entirely, most recently after an opening 77 in Dubai in February 2017, where he struggled to climb out of a bunker. So if his millions of fans want to label it the greatest comeback they have plenty of ammunition, but as a historian of the game Woods knows all about what Ben Hogan had to overcome to simply walk again, let alone return to golf and win six of his nine major titles, including all three he could contest in 1953. "As far as greatest comebacks, I think that one of the greatest comebacks in all of sport is the gentleman who won here, Mr Hogan," Woods said ahead of the Masters in April. "I mean, he got hit by a bus and came back and won major championships. 1994: While still a student at Stanford University, Woods has a benign tumour removed from his left knee. 2002: In December, Woods has a benign cyst removed and fluid drained from around one of the ligaments in the same knee. 2008: Two days after finishing runner-up to Trevor Immelman in the Masters, Woods has surgery on his left knee to clean out cartilage. 2008: After playing through the pain barrier to win the US Open - his 14th and last major - Woods has reconstructive surgery on the damaged ACL in his left knee and misses the rest of the season. 2008-09: During the 2010 Masters, Woods reveals that he tore his right Achilles tendon in 2008 and reinjured it several times in 2009. 2010: Woods withdraws from the final round of the Players Championship with an inflamed joint in his neck. April 26, 2011: Woods announces he will miss the Wells Fargo Championship after spraining his left knee and Achilles tendon while hitting an awkward recovery shot during the third round of the Masters. May 12, 2011: Woods withdraws from The Players Championship after shooting 42 on the front nine at Sawgrass. "The knee acted up, and then the Achilles followed after that, and then the calf started cramping up," Woods said. He does not play again until August. March 11, 2012: He withdraws from the final round of the WGC-Cadillac Championship with Achilles tendon problem. March 2, 2014: Back pain forces Woods' withdrawal from The Honda Classic with just five holes remaining in final round. In September 2018 he revealed that his back problems surfaced during the 2012 Ryder Cup and forced him to miss a session for the first time. April 1, 2014: Woods announces he will miss the Masters for the first time in his career after undergoing microdiscectomy surgery on a pinched nerve in his back after being advised to do so for his "immediate and long-term health". September 16, 2015: Almost a month after recording his best finish of season with a tie for 10th in the Wyndham Championship, Woods announces a second microdiscectomy surgery and hopes to return in "early 2016". October 30, 2015: Woods reveals he has undergone a "follow-up procedure" to September's surgery. December 2, 2016: He returns to action in the Hero World Challenge after 15 months out. February 3, 2017: After an opening 77, he withdraws from the Omega Dubai Desert Classic prior to the second round due to back spasms. April 20, 2017: Woods announces he has undergone spinal fusion surgery to alleviate "ongoing pain in his back and leg". He returned to action at the Hero World Challenge at the end of November.